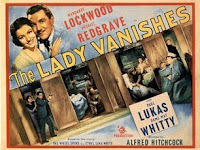 This is the third weekend in a row I've watched a new-to-me Hitchcock film, and it was absolutely terrific: THE LADY VANISHES, starring Margaret Lockwood and Michael Redgrave. Iris Henderson (Lockwood) is hit on the head as she boards a London-bound train and is aided by a kindly old governess, Miss Froy (Dame May Whitty). When Miss Froy disappears from the train, other passengers deny ever having seen the woman and it's suggested Iris imagined her due to her head injury. A musicologist, Gilbert (Redgrave), gradually comes to believe Iris and helps her unravel the mystery. The film has wonderful dialogue, understated British humor, and unique characters, whether it's a pair of cricket-obsessed Englishmen (Naunton Wayne and Basil Radford) who rise to the occasion when guns start firing, a mysterious, resourceful nun wearing high heels (Catherine Lacy), or Miss Froy herself, who may not be quite what she seems. (One of the things I noticed about the movie, incidentally, is there are several strong female characters, capable of giving as good as they get.) The characters played by Wayne and Radford were so popular they were reprised in other films, including NIGHT TRAIN TO MUNICH (1940), and also on the radio. The lovely Lockwood absolutely sparkles as Iris -- why haven't I seen more of her? I'm very glad I taped her film THE WICKED LADY a few days ago. Iris is resolutely but reluctantly headed to London for her wedding, and the gradual development of her unexpected relationship with Gilbert is very enjoyable, calling to mind Hitchcock films of the era such as THE 39 STEPS (1935), FOREIGN CORRESPONDENT (1940), or SABOTEUR (1942). Droll humor is sprinkled throughout, such as after Iris gives an incredibly detailed description of Miss Froy's clothing and Gilbert mutters "Well, then you must not have been paying attention!" Miss Froy likens a cramped hiding place to being in the Tube at rush hour (so true). The deadpan reaction of the cricket fan when his hand is shot was a favorite moment. The ability of Iris and Gilbert to immediately locate their fellow Brits at the movie's climax -- it's tea time, so of course they're in the dining car -- is another delightful touch of whimsy. I particularly enjoy Hitchcock's style in films such as this and FOREIGN CORRESPONDENT, where so much of the suspense is presented with a light touch. My daughter, who has now studied Hitchcock in both London and Los Angeles, recently mentioned that Hitchcock likes to use various devices to remind his viewers that they're watching movies. The opening of THE LADY VANISHES seems to be a perfect example of this, as a very obvious model train -- and even a cute little model car -- establish our setting. I tend to suspect, though, that rather than being deliberate this was a matter of a small budget! THE LADY VANISHES runs 96 minutes. It was shot in black and white. The supporting cast also includes Cecil Parker, Paul Lukas, Linden Travers, and Emile Boreo. A side note: I was struck that Michael Redgrave starred in a film in which a head injury figured prominently -- I couldn't help but think of the tragic death of his granddaughter, Natasha Richardson, earlier this year. 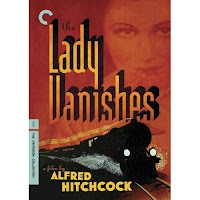 THE LADY VANISHES has been released on DVD by Criterion twice, in 1998 (the edition I watched) and 2007. The second release is supposed to have a better print, but I thought the 1998 print was just fine. Both releases have an identical commentary track; the later release has additional extras. The movie has had other DVD releases and has also been released in multiple editions on VHS. Previous reviews of Hitchcock films: THE 39 STEPS (1935), FOREIGN CORRESPONDENT (1940), MR. AND MRS. SMITH (1941), SABOTEUR (1942), SHADOW OF A DOUBT (1943), I CONFESS (1953), DIAL M FOR MURDER (1954), and MARNIE (1964). April 2013 Update: I was fortunate to see this movie on a big screen at the TCM Classic Film Festival, with longtime Hitchcock associate Norman Lloyd in attendance. You know me to be a Hitchcock fan from way back, so I've been enjoying your reviews and some of these "first viewing" experiences. This is one of my favorites. Very enjoyable film. It was great fun, J.C. I'm looking forward to taking another look at it soon via the commentary track. Hope you've been having a good summer! This is one of my favorite Hitchcock films, but it isn't a pure-Hitchcock. The movie was originally assigned to another director who started working on it. Eventually Hitchcock took on the project to hurry the fulfillment of his British contract so he could go to the U.S. (He'd already signed a contract with Selznick when he made this film.) He spent less time on pre-work for this than he did most of his movies. It's still great. Did you notice the screenwriters? Gilliat and Launder. The same team that brought us GREEN FOR DANGER! One of the reasons it's a great film. I wish the 3 could have paired on more films. Caldicott and Charters are fabulous! I think the only other British Hitchcock I've seen yet is THE 39 STEPS, unless I'm forgetting a title. My dad recently got YOUNG AND INNOCENT so I suspect I'll see it in the next few months, and I also recently taped MURDER! with Herbert Marshall.